If you need a new hot water system, or if you are looking to upgrade one, then it’s important to be as energy-efficient as possible. Hot water systems can often be responsible for 40% of a household’s energy usage and they can last for around 10 years, so choose carefully. Heat pump technology has been around for more than 100 years, so it is well and truly proven. They have been popularly in use for decades in the USA and many parts of Europe, particularly Italy and Spain. 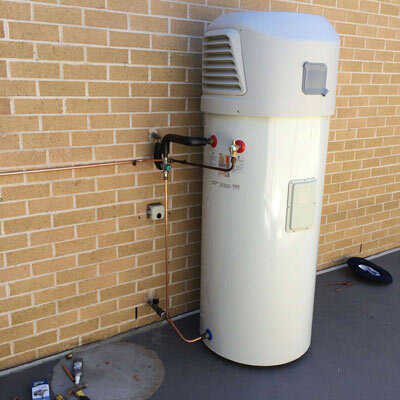 In Australia, thanks to generous government rebates and rising energy prices, more and more households have been making the switch to heat pump hot water systems. The Bosch Compress 3000 heat pump, available through this offer, is priced at $3820. These prices are based on a standard installation and already include the Federal STC rebate . Pricing may incur extra costs due to valves, pipe alterations, installation location and concrete slab. Yes! Hot water heat pumps attract rebates from the Federal Government as part of the Small Scale Renewable Energy Scheme. The way that a heat pump works is similar to an air-conditioner running ‘reverse-cycle’. The main difference is that a heat pump heats water rather than air. You have probably come across air-conditioners and have heard the ‘fan-coil’ unit whirring away on a hot day. Heat pump systems are similar and care should be taken when choosing where to locate a heat pump, for example, away from bedrooms or places where the noise might disturb others. It is true that in areas of frequent frost, the system takes a little longer to heat up the water. However, the Bosch heat pump has a built-in electric element which can be ‘kicked in’ during any period of extremely cold weather. Regardless, it is designed to operate in conditions from -7°C to 40°C. Depending on your location it may be possible to set up the heat pump to operate on a controlled load electric tariffs. If available, this means you can operate the heat pump on a much lower electricity tariff leading to even more dollar savings! Please check with your electricity retailer to see if this is possible in your area. Heat pumps can reduce your hot water costs by up to 65%. Get an obligation-free quote today!